I’m in the middle of organising my family’s trip to Thailand next week. The small troupe of 4 people has now grown to 9. It seems that no one wants to miss out on this one after we all had such a fun time there last year. This year we are visiting the wild town of Pattaya followed by a few days in Bangkok, one of my top 5 cities in the world. There’s a strange serenity that I like in the big crazy city of Bangkok. It’s always a nice experience visiting there. 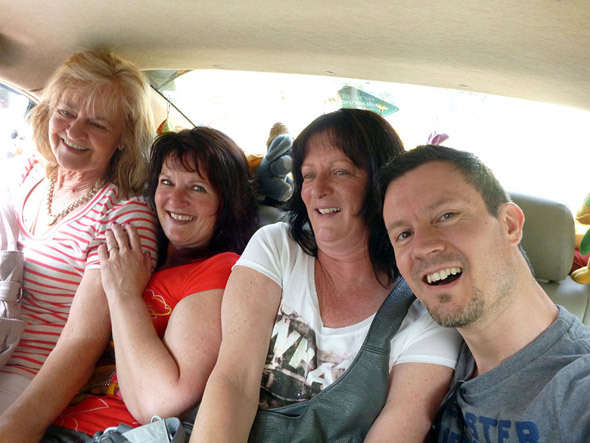 Here’s are my mum and sisters squeezing in to the back of a taxi cab during last year’s visit. This entry was posted on Sunday, August 26th, 2012 at 9:19 am	and is filed under This Week In The Loft. You can follow any responses to this entry through the RSS 2.0 feed. You can leave a response, or trackback from your own site.